Fluoride Glass Fiber Optics reviews the fundamental aspects of fluoride glasses. This book is divided into nine chapters. Chapter 1 discusses the wide range of fluoride glasses with an emphasis on fluorozirconate-based compositions. The structure of simple fluoride systems, such as BaF2 binary glass is elaborated in Chapter 2. The third chapter covers the intrinsic transparency of fluoride glasses from the UV to the IR, with particular emphasis on the multiphonon edge and electronic edge. 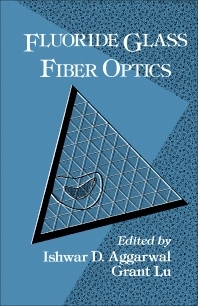 The next three chapters are devoted to ultra-low loss optical fibers, reviewing methods for purifying and analyzing the fluoride glass raw materials. The sources of loss are considered in Chapter 6, while the work performed on the durability of fluoride glasses is analyzed in Chapter 7. Chapter 8 focuses on the effects of radiation on fluoride glasses. The last chapter deliberates the area of active phenomena such as doping of fluoride glasses with rare-earth elements for fluorescence and lasing, as well as frequency doubling. This publication is a good reference for students and researchers conducting work on fluoride glasses.